Incompressible jets transversely issuing into a spatially-developing turbulent boundary layer is one of the most challenging types of three dimensional flows due to its thermal-fluid complexity and technological applications; for instance, film cooling of turbine blades, fuel or dilution air injection in gas turbine engines, thrust vector control, chimney plumes, just to name a few. The ability to control a flow field in such a way to enhance thermal efficiency is of crucial relevance in aerospace and other engineering applications. 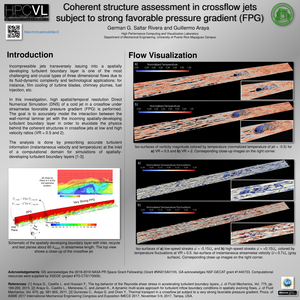 Direct Numerical Simulation (DNS) with high spatial and temporal resolution of jets in crossflow subject to very strong Favorable Pressure Gradient (FPG) is performed. The analysis is done by prescribing accurate turbulent information (instantaneous velocity and temperature) at the inlet of a computational domain for simulations of spatially-developing turbulent boundary layers, where temperature is assumed a passive scalar. 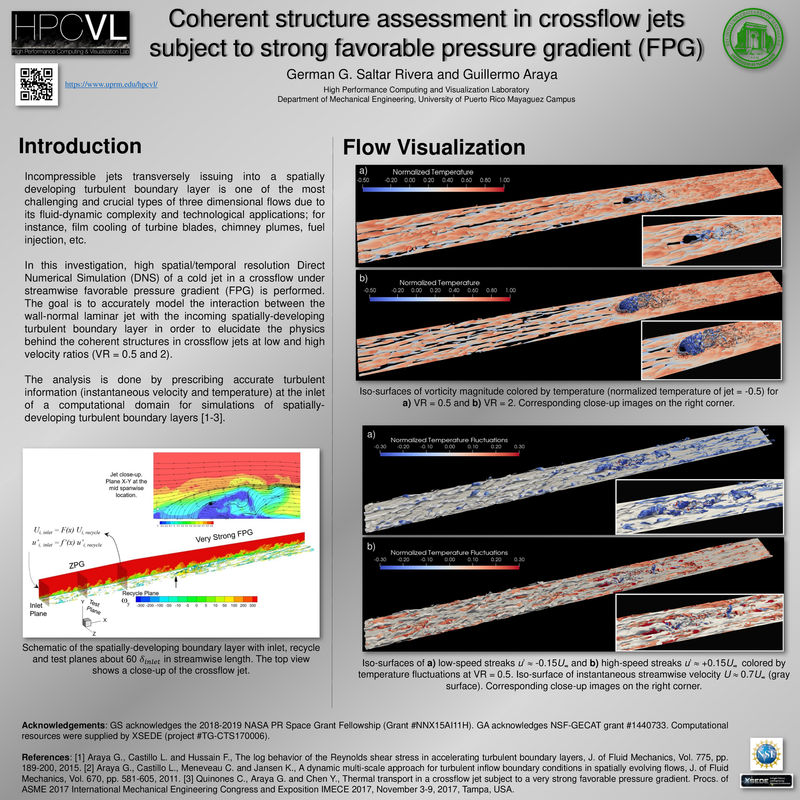 The main goal consists on to better understanding of the physics behind momentum/scalar coherent motions emanating from crossflow jets under strong favorable pressure gradient (FPG).